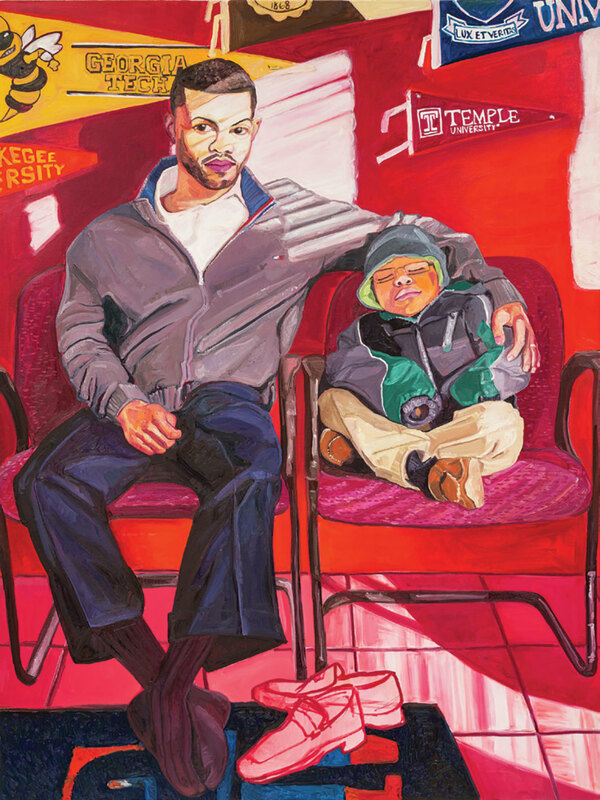 Jordan Casteel, Marcus and Jace, 2015, oil on canvas, 72 × 54". Two portraits placed early in Jordan Casteel’s first solo museum show, in her hometown of Denver, feature sitters in nondescript environments. Mom, 2013, employs a muted palette. The background is beige, with plum scumbling in the upper corners; the absence of background details focuses the viewer on the figure. Casteel’s mother sits in a wooden chair, her eyes closed, head resting on her folded hands. Her face is a delicate patchwork of tans, browns, and grays, the scarf or sweater in her lap a complex, gestural pattern that repeats in the jewels of her bracelet. She doesn’t acknowledge us; we are observing a moment of quietude, rest, and contemplation. The more recent portrait, Twins, 2017, conveys another mood entirely. Two toddlers, one clad in red and the other in pink, a Minnie Mouse blanket draped across their laps, are strapped into a double stroller and sit facing the viewer.